More than a third of homeless people in King County sleep not in a tent or under a bridge, but in a vehicle. Yet after Seattle backed away from a homeless RV lot, there is no clear strategy to get them inside. ONE night last January, teams of volunteers swept across King County, looking under bridges and in alleys for homeless people. They found 4,505 people out in the cold, a disturbing 19 percent increase from the year before. But one number from last year’s annual One Night Count got overlooked. More than one-third of the homeless were sleeping in vehicles — more than were found beneath underpasses, in doorways, in alleys, at bus stops or in tent cities, combined. Most commonly, the face of homelessness in King County is a person sleeping in a vehicle. 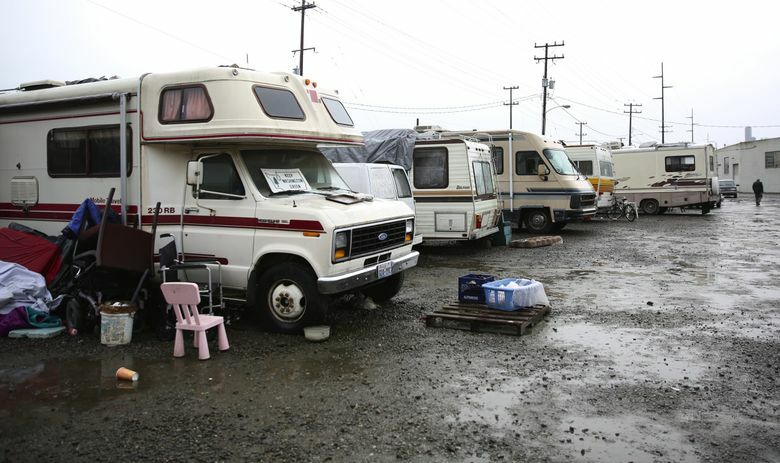 Seattle alone estimates about 500 RVs and 1,000 cars, trucks or vans are used as living quarters on any given night. A new One Night Count, scheduled for next Friday, will probably turn up even more. Yet for all the new spending, and urgency, to fight the region’s rising tide of homelessness, there is frustrating little progress to address vehicle campers. Times’ reporter Nina Shapiro recently documented how the city of Seattle’s plans to move RV campers into supervised lots have fizzled under ballooning costs. Instead of two lots with 100 RVs, the city’s pilot project is now at one lot with 15 RVs. It’s not much better for people sleeping in cars. The city’s Road to Housing program for years focused on coaxing churches to open unused parking lots to overnight car campers, and helping vehicle campers into permanent housing. This is an important problem that needs more attention. Sleeping in a car or RV on the streets is dangerous. Without a clear city policy, neighborhoods rightly grow frustrated if RV campers on their streets prove to be bad neighbors. And there’s no other place for them to go, except to shuffle on, risking tickets or vehicle impounds that strip homeless people of their last asset. There clearly needs to be more urgency about vehicle campers from All Home and Seattle. One strategy should be to build on what faith groups in the King County suburbs are already doing. In Kirkland, the Lake Washington United Methodist Church has opened its parking lot, and its bathrooms and kitchen, to vehicle campers for years. Kent United Methodist also welcomes car campers. Riverton Park United Methodist in Tukwila has a safe parking lot as well as tiny homes, tent camping and an indoor shelter. For churches considering opening lots, Seattle University’s family homelessness project has a list of resources and recommendations. Getting homeless people out of RVs and cars and into permanent affordable housing must be the goal. But as a community, let’s at least allow them to safely park at night.